Large concrete piles are one of the important elements of modern constructions. They serve as high-loaded foundations of various buildings. To dismantle the burdens of buildings, piles often have to carry up to 8 MN into very deep layers of good bearing soils. To avoid the slightest settlements which may effect enormous damages on buildings, great demands have been made to the quality of piles. Buildings like the ,,Pont de Normandie" which has recently been built up and the multi-storey building ,,Commerzbank II" in Frankfurt which is still under construction have foundations consisting of large concrete piles. They were executed by foundation engineers of the BILFINGER + BERGER Bauaktiengesellschaft. These two projects are an evidence that despite of difficult marginal conditions a length up to 60 m and 2.10 m in diameter are practicable to be concreted. The piles of both buildings were examined by ultrasonic technology to check the quality of concrete. Substantial sources of errors due to anomalies in a body of concrete are based on the fact of the complex concreting operations, including the delivered quality of concrete. A separation of concrete components could lead to gravel pockets and zones of minor quality when concreting under water. This should be prevented by fixed concreting operations. Other sources of errors are particles of soil stabilizing fluids or water which deposit at the bottom of the pile as a soft stack. The quality of the bottom of the pile thereby reduced was counteracted by rinsing and cleaning for a long time before concreting. A typical diagram of sonic speed depending on pile length is shown in figure 2. In a depth of 12 m a defect has been found. Along with concrete, reinforcement is an essential element of the pile foundation for carrying bending moments. 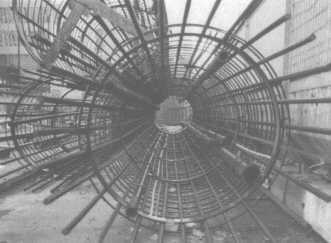 The reinforcing cage in the weight of tons is installed in several sections according to the special length of pile before concreting. Steel pipes (see figure 3) fastened to the reinforcement make an access possible with transmitter and receiver in the marginal zone of the pile about the whole length. 111 piles about 180 cm in diameter, reduced to 150 cm at half of the total length, with telescope casing mean a length of 45 m, were established by the foundation of the highest office-center in Frankfurt. 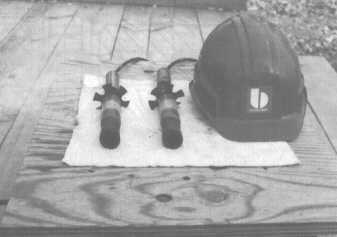 The cross-hole-sonic-testing was carried out with four steel pipes integrated into the reinforcement. BILFINGER + BERGER Bauaktiengesellschaft carried out the ultrasonic tests with the help of efficient equipments of the state-of-the-art technology world-wide. In addition to the construction of the probe a matter of the principle of Gemini-systems of BILFINGER + BERGER Bauaktiengesellschaft is the computer-measurement-technology which is based on a modern equipment The probes are shown in figure 4. Compared with conventional analyses of systems of signals, evaluations and documentations could be carried out more effectively. A special evaluation software facilitates a lead-in up to a single sound-impulse in the time of analysing a measuring. The measuring chain of this system mainly consists of transmitter and receiver-probe, impulse control mechanism, step control mechanism, computer measuring unit and software. 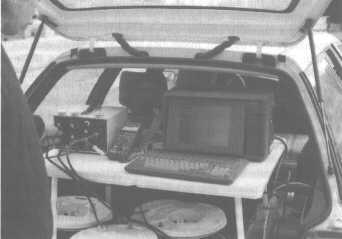 Preparatory for measuring, the computer system of impulse and step control mechanism have to be installed in a car or van as near as possible at the pile which has to be checked (see figure 5). The steel pipes have completely to be filled with water. On the top of the pipe wheels are installed to carry the measuring cables to the bottom of the piles. For the control of parameter the probes will be synchronized by the help of depth-markings at any level preferable at the maximum depth. At this level the transmitting signal could also be optimized with a special equipment. Exciter voltages and frequencies are substantial parameters. The probes will be lowered to the deepest point synchronized and the electronical mode of measuring will be activated. 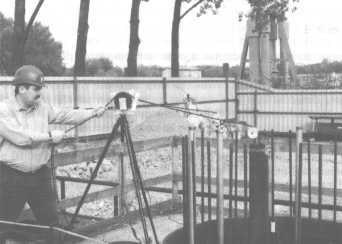 Now, the cables will be laid by hand over the depth gauge installation for continuous measuring, in which impulses and measurings will be set in regular distances, for example all 6 cm (procedures see figure 6). For this purpose conventional ultrasonic systems usually supply only one graphic on a paper strip as an evaluation. At best this graphic could be saved electronically, but not the single data which are important for the analysis of signals. This system records the course of each single measure impulse and saves them during a measure course. So you don t have to cope with a lot of papers. If necessary, the result of measuring can be seen directly on the screen after measuring. The actual evaluation happens after finishing the measuring in the office. The electronical course of analysis of the signals will be in time with the respective parameters of measuring and the extent of running time about the length of the pile will be printed out. In view of the probe distances, the sonic speed between each measure pipe can also be printed out. An advantage of the evaluation mechanism is that over the whole length of the pile each signal of the receiver can be retrieved and assessed by pushing a button. The documentation of the data consists of the graphic evaluation of sonic speed about the length of the pile. If you got 4 measure pipes there will be 6 records existing of 2 diagonal measurings and 4 side-by-side measurings. This record mainly consists of data of the piles and a plan which clarifies the direction of measuring. In addition to the records of sonic speed it is possible to print further receiver signals at some levels. An overlay to every pile gives clear information about the quality measured. The inserted measuring system including software mainly consists of units by Olson CSL-2. This hardware and software was modified to our special request at the construction site. The experience with this measuring system is very good. It is possible to use this system in many other fields with little modifications. This gauging technology becomes a clear and calculable performance regarding the whole building with the help of an evolved equipment as the above mentioned ultrasonic system. With the help of these measurings the mistakes can be early detected in a very complex construction course and a solution can be found. In this connection the technology of ultrasonic is not only quality control, it is also optimization of the concreting procedure. If you got optimal conditions on the site you get testing results of 10 piles a day with the described modern technology. The expenditure is low in relation to the advantage of an early assessment and minimization of damages. This technology has gradually been used in Germany even though it has been used in the case of high-quality foundations and diaphragm walls for a long time all over the world.